Ares M4 COB ARO16 Airsoft rifle. 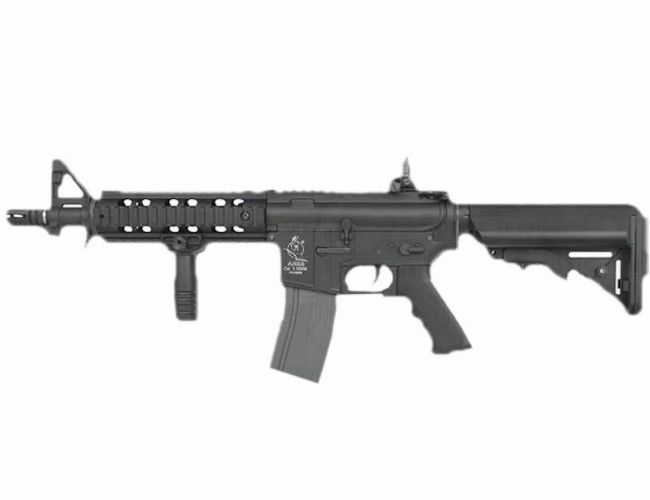 ARES M4 CQB with Metal Rail Airsoft gun. Full Auto mode, Semi Auto mode or Safe Mode.Comes with a 240 mm Aluminum Barrel and Metal Flash Hider Nylon Receiver, with Crane Stock and Rubber Pad has 5 positions..It also has a Detachable Spring Loading back sight and Fixed sight at front with free floating fail system and a fore grip. The magazine is a 300 Rounds capacity. A tough Nylon Fibre Receiver. Aluminum Outer Barrel 240 mm. Stock With Pad 5 settings. Flip-up Rear sightand Fixed Front sight. Use 8.4V Mini Type battery. Length 683mm / 768mm ( Fully Extended). AEG Power Source 8.4V Mini battery. Crane Stock (Nickel / Li-Po).